We study circadian rhythms in the immune response using an interdisciplinary approach at the intersection of immunology, biochemistry and physiology. The recruitment of leukocytes to tissues and their localization within tissues plays a crucial role in the immune response. Recruitment of leukocytes to tissues underlies a circadian, i.e daily rhythm. This supports accumulating evidence for circadian oscillations in many components of the immune system with the potential to affect disease onset and therapies. Our group studies leukocyte migration patterns using various intravital microscopy techniques in different tissues. 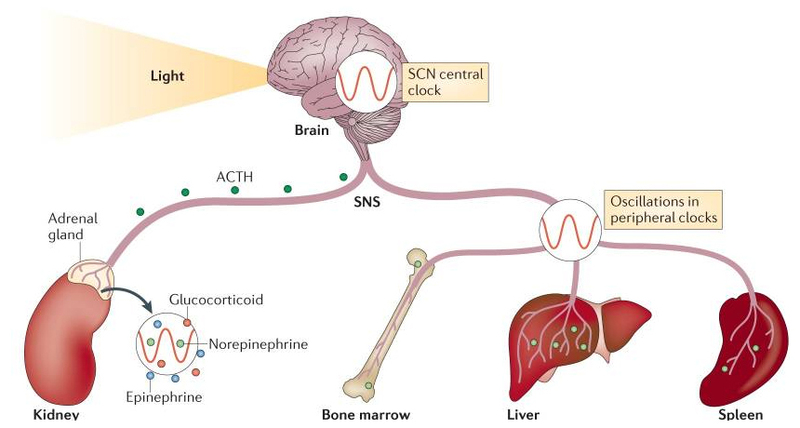 Specifically, the focus is on how neural influences regulate the circadian migration of leukocytes to tissues, which promigratory factors control these rhythms and whether they can be altered by surgical, pharmacological or genetic interventions. The goal is to provide novel mechanistic insight into the systemic regulation of leukocyte trafficking with the potential for time-based, i.e. chronotherapeutic, interventions in inflammatory diseases. Copyright © 2019 SCHEIERMANN LAB. All Rights Reserved.